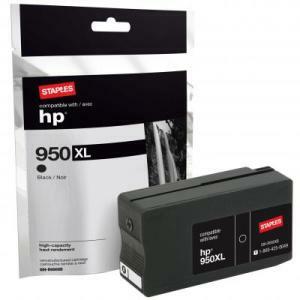 The Staples CSIH-R950BX Black Ink Cartridge has a printing life of up to 2,300 pages at 5% coverage and is compatible with the HP 950XL. Designed to be a quality alternative to the OEM product while offering significant cost savings. From the eco-preferable manufacturing processes and product components to packaging materials, Staples cartridges are certified to ISO 9001:2000 standards, which means high-quality printing with no spotting, smudging or fading.